Carlow has not had representation with the Association of Irish Musical Societies (AIMS) since the Dolmen staged Oliver in 1998. 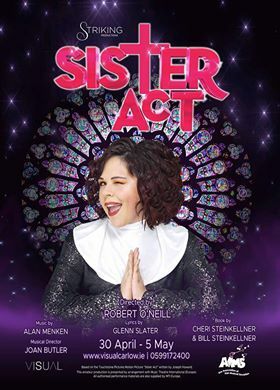 This year, all that is about to change with Striking Productions staging Sister Act the musical, which has been licensed to Carlow from Music Theatre International in London. The show runs for six performances from April 30 – May 5. It is directed and produced by Robert O’Neill, who has been responsible for the annual pantomime at VISUAL for the past seven years, producing shows like Cinderella, A Christmas Carol and Beauty and the Beast. Musical director is Joan Butler nee Farrell, a Carlow native now resident in Thurles where she conducts the Ursuline choir. Tracey Rea has taken the reigns as dance captain. Stage management is by Emma Nolan, again part of the annual panto team and a member of Carlow Little Theatre Society. Taking the starring role as Deloris is Kayla Kehoe. Riccardo Tavolieri plays bad guy Curtis while Carlow stage staple Paddy Behan plays Monsignor O’Hara. Audrey Cooper plays the stern Mother Superior and other lead nuns include Cathriona Kelly as Sr Mary Patrick and Siobhan Kavanagh as Sr Mary Robert. The show also features a live ten-piece band and a cast and chorus of all local talent. The musical follows Deloris Van Cartier, a disco diva whose life takes a surprising turn when she witnesses a murder. In panic, she seeks help from the cops. Under protective custody she is hidden in the one place she won’t be found – a convent! Tickets are on sale from www.visualcarlow.ie or call 059 917 2400.